ThinkerThunker has a video reporting that Patty from the Patterson/Gimlin film has a higher shin rise angle than humans. When humans walk on a level surface, they have a 52 degree shin rise where Patty has a 73 degree shin rise. While I don't doubt the measurements I do doubt the conclusion. While viewing the thousands of Bigfoot/Sasquatch/Yeti posts on Facebook recently I decided to tackle a subject that will likely upset many believers. 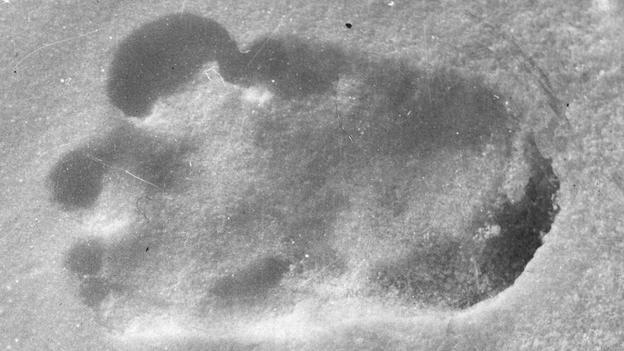 I am referring to the Iconic Eric Shipton photo of a supposed Yeti track. Over the years it seems that most Believers accept this as evidence of the existence of Yeti. It is my belief that this track is actually two prints. Upon noticing the ridges to the right of the heal it appears there was another print set almost diagonal. When looking closely, one can see the heal impression of the other foot. With bears having a slight pigeon toed walk with their front paws this indicates to me the track is two steps. There is the diagonal step of the front and straight ahead step of the rear. This bear walks in it's own footsteps which I believe is conditioning brought on by the icy, snowy environment. The ridges were from the heal of the front foot where attempting to gain traction provided enough push-back on the ice that it created fissures directly behind the heal. When two people walk in line up a snowy hill the second person usually walks in the tracks provided by the person ahead so they can gain more traction. This is something that can easily be adapted by a heavy animal that relies on pads for traction. Animals as well as people generally take the path of least resistance. With all the concern and hype around this photo nothing in it shows evidence of the existence of the Yeti. On the other hand, the photo does show evidence of the Himalayan Black Bear. I have provided the reference below since I found an excellent article by Michael Trachtengerts that shows exactly what I see when viewing the Shipton Photo. Photos From April 11, 2015 Day Trip. Here are a few photos I took while out the other day. There was no animal activity. Not even any birds around. It was kind of weird. Here is a video I shot at the bottom of the hill. I was 50 to 75 yards into the marsh at this point. While this was only a day trip, I feel that this was a good area to find some evidence of Sasquatch. The lack of wildlife was telling of an apex predator that lives nearby or frequents this area. My next trip will be longer than just a day and along another creek. I'll probably make that one for two or three days. Perhaps even a week or so. In the past I have commented on tree structures but there is an obvious reason for their existence that I missed mentioning. 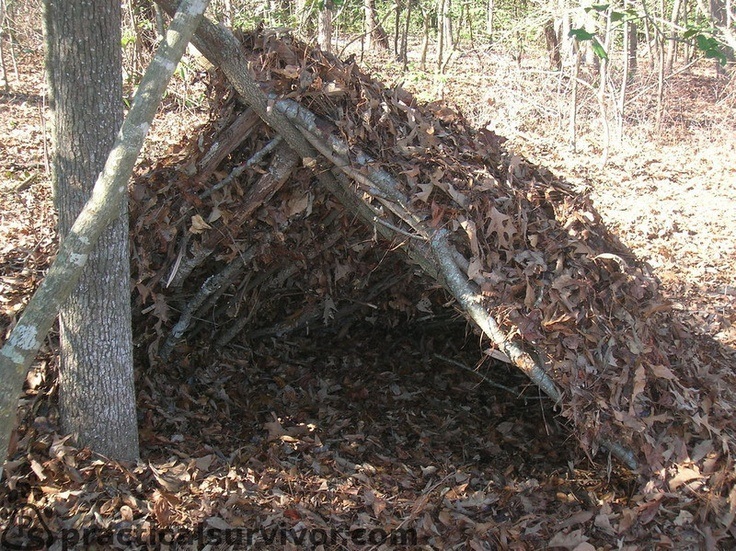 Survival Shelters.